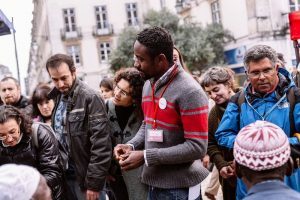 The European Migrantour network is also supported by the project “New Roots – Migrantour intercultural walks building bridges for newcomers active participation“, co-funded by the European Union (AMIF Fund) and Intesa San Paolo. The project is promoted by ACRA, Viaggi Solidali coop.soc, Oxfam Italia, Baština, Terra Vera, Renovar A Mouraria, Crescer, Alter Brusseles e Casba coop. soc. The initiative aims to provide a new instrument for integration that promotes the cultural heritage brought by migrant citizens, asylum seekers and refugees, and it will contribute to the development of a new narrative on the phenomenon of migration. Active in 10 cities of 4 different European countries, this initiative is built on the basis of the results achieved by the Migrantour project. 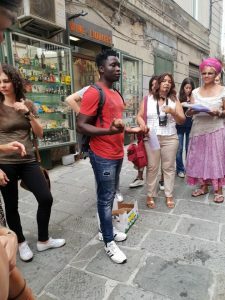 As in previous experiences, since the first pilot project carried out in 2010 in Turin, the migrants will play a fundamental role in the development of an alternative and positive way to tell the phenomenon migration. With this new project, a special attention will be paid to the needs of newcomers, asylum seekers and refugees in order to develop their sense of belonging to the local community and to promote their active participation. Diffusion of Migrantour as an innovative and sustainable tool for intercultural integration and education with the purpose to turn the reception of migrants into opportunities for the future society.